Orthostasis is the presence of at least one of the following: a decrease in systolic blood pressure by ≥20 mm Hg, a decrease in diastolic blood pressure by ≥10 mm Hg present within 3 minutes of standing or a head up tilt table at 60⁰. Orthostatic hypotension is a physical sign that warrants diagnosis of its underlying etiology. Medications: Alpha blockers, diuretics, tricyclics, possibly SSRIs and atypical antipsychotics. 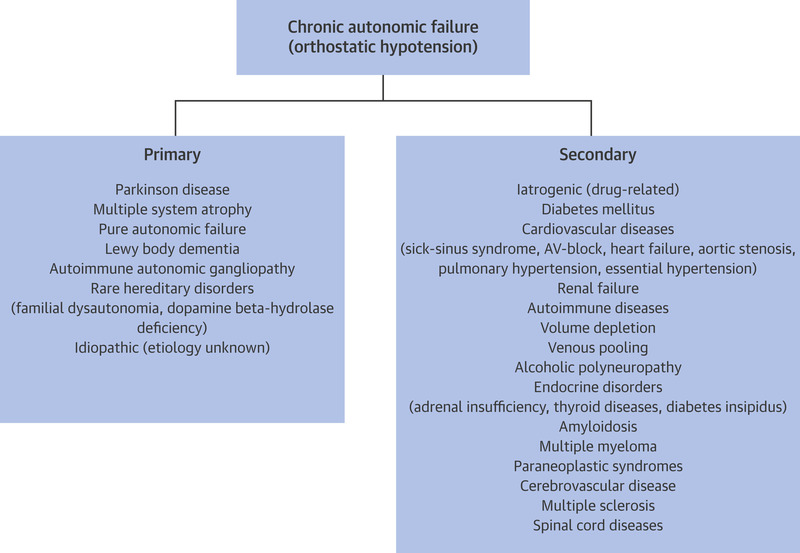 Chronic Autonomic Failure: The following figure shows the primary and secondary causes of chronic autonomic failure. Orthostasis increases among the elderly in nursing homes to >50%3. Thirty percent of syncope in the elderly population is because of orthostasis. Orthostasis is associated with an increased risk of cardiovascular disease including stroke, coronary artery disease, and chronic kidney disease, as well as all-cause mortality among those aged 55 years and older. Upright posture causes pooling of approximately 500 -700mL of blood in the lower extremities, pulmonary and splanchnic circulations and interstitial spaces. This causes decreased venous return, cardiac output, and arterial pressure, the normal physiologic response to which is increased carotid baroreceptor activity to increase sympathetic tone in order to maintain blood pressure. Under normal conditions this should not result in a major change in blood pressure. This normal reflex is lost in central and peripheral autonomic dysfunction causing orthostatic hypotension. The normal increased heart rate of 10 to 25 beats per minute (bpm) with standing is not seen in autonomic failure. In postural orthostatic tachycardia syndrome (POTS), the heart rate increases by >30 bpm, with signs of cerebral hypoperfusion. In neurocardiogenic syncope, there is increase in vagal activity along with the loss of reflex efferent sympathetic activity causing bradycardia along with transient orthostasis. OH has been associated with lower cognitive performance in those age >50, especially if also has supine hypertension.3. In those up to age 80 keeping blood pressure < 140/90 mm/Hg is associated with a decreased risk for CV morbidity and mortality. Syncope-OH is the second most common cause of syncope at approximately 15%. Reflex syncope (neutrally mediated) is transient loss of consciousness due to a reflex response that includes vasodilation and/or bradycardia(rarely tachycardia). This leads to a systemic hypotension and cerebral hypoperfusion. Types-vasovagal, situational, carotid sinus, idiopathic. A detailed history should be obtained including medication, weight loss and nutritional intake, falls, volume loss, and comorbidities causing autonomic dysfunction. Include in history urinary retention, constipation, decreased secretions and erectile dysfunction. An autonomic, neurologic, cardiovascular, and endocrine review of systems should be performed. Blood pressure and heart rate are taken in all 3 positions, supine, sitting, and standing, with 3- to 5-minute intervals. Physical examination should be comprehensive, including a neurologic examination to assess for Parkinson’s disease, cognitive impairment, depression, stroke, and peripheral neuropathy. Volume should be assessed by examining mucosa, skin turgor, and jugular venous pressure. The carotid arteries should be examined for bruits. Because murmurs in idiopathic hypertrophic cardiomyopathy and mitral valve prolapse may be more prominent in standing, the heart must be auscultated in standing too. Because orthostasis leads to complications, such as falls, it has a significant impact on loss of function and independence with activities of daily living (ADLs) and mobility. In the elderly, because autonomic failure manifests in multiple ways as constipation, urinary difficulties, sexual dysfunction, and night blindness, functional assessment is imperative. Because of the multifactorial etiology of orthostasis, enumerating all testing needed in its diagnosis is outside the scope of our topic. Initial tests are done for common etiologies and are based on clues from history and physical examination. Hemoglobin and hematocrit and folate and cobalamin levels for anemia. White blood cell for infection and sepsis and platelet count for bleeding, purpuras, and ecchymoses. Electrolytes, blood urea nitrogen, and creatinine to assess volume depletion in dehydration because of gastroenterologic causes, burns, sepsis, and decreased intake, and overall renal function. Investigations may be needed for tabes dorsalis and diabetes in sensory loss, adrenal insufficiency (morning cortisol levels), and cardiac enzymes (cardiac ischemia). Cardiac symptoms including chest pain, dyspnea, and lower extremity edema are worked up with an electrocardiogram and an echocardiogram in addition to laboratory testing. Cerebellar symptoms and a suspicion of stroke require work up for ischemic and hemorrhagic stroke with computerized tomography, magnetic resonance imaging, and magnetic resonance angiogram. Head-up tilt-table testing, which should be ordered when orthostatic hypotension is suspected in spite of normal blood pressure readings and the patient is unable to stand up for measurement of orthostatic vital signs. The cold pressor test – the normal sympathetic response to immersing the hand in cold water at 4°C is an increase in systolic blood pressure of 15 mm Hg and diastolic blood pressure of 10 mm Hg. Outcomes depend on the underlying etiology. Acute orthostasis is reversible, whereas chronic orthostasis is disabling and difficult to treat. Environmental and behavioral changes help in orthostasis management. A urinal or bedside commode so that patients do not have to get up quickly, caffeinated beverages prior to meals, water intake before standing, and avoiding hot climate improve symptoms. Family and caregivers should be educated to monitor side effects of medication, such as supine hypertension. Other side effects, such as precipitation of congestive heart failure with mineralocorticoids and urinary obstruction with midodrine, warrant that the support system involves resources for early detection and management. Referrals should be made to a neurologist for autonomic testing when etiology is not ascertained and to a cardiologist for uncontrolled supine hypertension. Consultation should be timely in order to prevent avoidable complications of orthostasis by facilitating the treatment of reversible causes. The primary goal in treating orthostasis is to decrease the incidence and severity of postural symptoms rather than achieving upright normotension, because this can lead to supine hypertension. Medical rehabilitation management includes therapeutic approaches subsequently delineated with an interdisciplinary approach. The first therapeutic intervention must be controlling reversible causes and precipitators, such as high carbohydrate intake, warm weather, alcohol intake, and dehydration. Low and colleagues recommend a formal grading scale based on frequency and severity of symptoms, standing time before onset of symptoms, and influence on ADLs. Grade I or II refers to those that might not need drugs, whereas grades III or IV refers to patients that will need aggressive therapy.11, 12 Grades I-IV are described in the pyramid with accompanying explanation below. Leg crossing prior to standing. Dorsiflexion of feet prior to upright posture. Waist high compression stockings and abdominal binders. Raising the head of the bed by 10 to 20° at night especially in patients with hypertension. Water aerobics and recumbent bicycling help with reconditioning. Spreading of total carbohydrate intake throughout the day. Water-500 mL of water intake increases blood pressure by about 40 mm Hg with effects peaking at 30 minutes, and can last for up to 2 hours. Salt added to diet and in the form of tablets. Must monitor fluid and salt intake in patients with renal disease. Fludrocortisone: Synthetic mineralocorticoid. Initial 0.1 mg daily; maximum 1 mg daily. Fludrocortisone has been evaluated in open-label trials and has long-established usage in clinical practice. Side effects include- hypokalemia, headache, heart failure, worsened supine hypertension, and ankle edema. Other agents: Pyridostigmine,15 a cholinesterase inhibitor, and erythropoietin, which increases red cell mass and blood volume. While studies show that pyridostigmine causes less supine hypertension, which is a side effect of both fludrocortisone and midodrine, it is not Food and Drug Administration approved for orthostasis. Orthostasis requires an inter-, trans-, and multidisciplinary approach for management. Serious adverse effects, such as syncope and arrhythmias, can be avoided while performing the tilt table test by coordinating with a team trained in advanced cardiac life support.16 Rehabilitation teams should be informed about the etiologic diagnoses. Patients should be made aware that support garments should be removed when supine in order to maintain their efficacy. Patients and family should be counseled as to the nature of the underlying disorder, and therefore reversible causes of orthostatic hypotension are removed and medication adverse effects are managed. Treatment outcomes data, especially pertaining to rehabilitation, need further research. It is common to attend to the patient’s blood pressure. However, the difference between treating hypertension and orthostatic hypotension is that while high blood pressures are treated to prevent complications in the future, the goal of treating all orthostatic hypotension is to improve the patient’s function by improving symptoms and depletion is that with the latter, there is increased heart rate on standing, which is absent in the former. Do not avoid treating hypertension in hopes of preventing OH, especially in those < 80. Consider Geriatrics referral in those patients especially >80. Animal studies are looking at various substances including anti-oxidants, pro-inflammatory cytokine inhibitors, ACE inhibitors, superoxide dismutase mimetics and statins. Ricci F, DeCaterina R, Fedorowski A. Orthostatic Hypotension: Epidemiology, prognosis and treatment. Journal of American Cardiology. 2015;66/7, 848-860. Rutan GH, Hermanson B, Bild DE, Kittner SJ, LaBaw F, Tell GS. Orthostatic hypotension in older adults. The Cardiovascular Health Study. CHS Collaborative Research Group. Hypertension. 1992;508-519. Frewen J, Finucane C, Savva GM, Boyle G, Kenny RA. Orthostatic hypotension is associated with lower cognitive performance in adults aged 50 plus with supine hypertension. The Journals of Gerontology Series A: Biological Sciences and Medical Sciences. 2013; 878-885. Metzler M, Duerr S, Granata R, Krismer F, Robertson D, Wenning G. Neurogenic orthostatic hypotension: Pathophysiology, evaluation, and management. Journal of Neurology 2012; 2212-2219. Cheng YC. Gender differences in orthostatic hypotension. American Journal of Medical Science 2011;342:221-225. Jansen RW, Lipsitz LA. Postprandial hypotension: epidemiology, pathophysiology, and clinical management. Annals of Internal Medicine 1995;122:286-295. 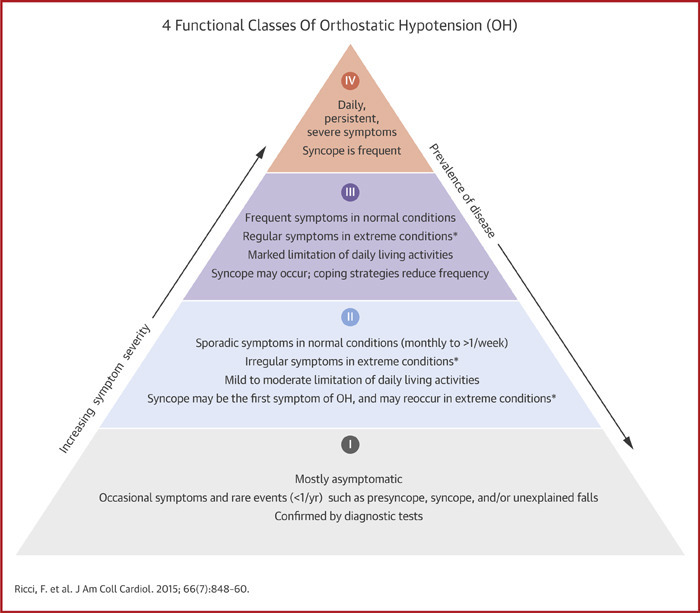 Arnold AC, Shibao C. Current concepts in orthostatic hypotension management. Current Hypertension Reports 2013;15.4:304-312. Maule S, Papotti G, Naso D, Magnino C, Testa E, Veglio F. Orthostatic hypotension: evaluation and treatment. Cardiovascular Hematology Disorders and Drug Targets. 2007 ;7:63-70. Mukai S, Lipsitz LA, Orthostatic hypotension. Clinical Geriatric Medicine.2002;18:253-268. Stewart J. Chronic orthostatic intolerance and the postural tachycardic syndrome(POTS). Journal of Pediatrics. 2004;145(6)725-730. Low PA, Suarez GA, Benarroch EE. Clinical autonomic disorders:classification and clinical evaluation. 2nd ed. Philadelphia: Lipincott-Raven;1997. Low PA. Management of neurogenic orthostatic hypotension: an update. Lancet. 2008;7:451-458. Freeman R. Current pharmacologic treatment for orthostatic hypotension. Clinical Autonomic Res. 2008;Suppl 1:14-18. Hoeldtke RD, Cavanaugh ST, Hughes JD. Treatment of orthostatic hypotension: interaction of pressor drugs and tilt table conditioning. Archives of Physical Medicine and Rehabilitation. 1988;69:895-898. Singer W. Pyridostigmine treatment trial in neurogenic orthostatic hypotension. Archives of Neurology. 2006;63:513-518. Lanier JB. Evaluation and management of orthostatic hypotension. American Family Physician. 2011;84:527-536. Eegan BM, O’Connor M, Donnelly T, et al. Orthostatic hypotension: a new classification system. Europace. 2007;9:937-941. Izcovich A, Gonzalez M, Manzotti M, Catalano HN, Guyatt G. Midodrine for Orthostatic hypotension and recurrent reflex syncope: A systematic review. Neurology. 2014;83.13:1170-1177. Cooke J, Carew S, Quinn C, O’Connor M, Curtin J, O’Connor C, Saunders J, Humphreys E, Deburca S, Clinch D, Lyons D. The prevalence and pathological correlates of orthostatic hypotension and its subtypes when measured using beat-to-beat technology in a sample of older adults living in the community. Age and Ageing. 2013;42.6:709-714. Shaw BH, Claydon VE. The relationship between orthostatic hypotension and falling in older adults. Clinical Autonomic Research. 2013;24.1:3-13. Deepthi S. Saxena, MD. Orthostasis. 12/28/2012.